"Jefferson Awards Gala Celebrates a Dedicated Faculty Member"
(2010) "Jefferson Awards Gala Celebrates a Dedicated Faculty Member," Jefferson Surgical Solutions: Vol. 5 : Iss. 1 , Article 8. 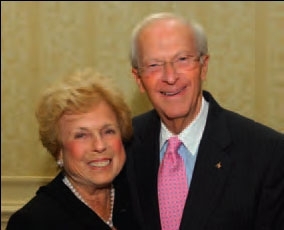 On October 22, 2009, the Jefferson community celebrated the contributions of Herbert E. Cohn, MD, FACS, at the Seventh Annual Jefferson Awards Gala. Dr. Cohn, a Jefferson Medical College alumnus, distinguished member of the Department of Surgery faculty, teacher and administrative leader, received the Achievement Award in Medicine, recognizing his career in thoracic and endocrine surgery. More than 500 guests attended the event which raised close to $600,000 for Jefferson. Among the many alumni, faculty and friends who generously supported the Gala was Mrs. Irmine Pilmes, a longtime patient of Dr. Cohn’s. Dr. Cohn cared for both she and her husband, Alexander Bondaretz, over many years and earned their deep appreciation. When Mrs. Pilmes learned of the Gala, she decided to make a significant contribution to Jefferson in Dr. Cohn’s honor. For Mrs. Pilmes, the best vehicle for such a gift was through her estate. She worked with the Jefferson Foundation and her attorney to develop language in her will that would direct $100,000 to the Department of Surgery in support of thoracic and endocrine surgery education and research. For additional information about planned giving, or to make a contribution to the Department of Surgery, please contact Lara Goldstein in the Jefferson Foundation at 215-955-8797 or lara.goldstein@jefferson.edu.